Tony McEvoy’s three-year old filly Sunlight returns to the races this weekend, backing up from a disappointing run in last Friday’s Ladbrokes Manikato Stakes (1200m) at The Valley. Sunlight, above, is one of the favourites to win the Coolmore alongside Written By and Zousain. Photo Credit: Steve Hart. 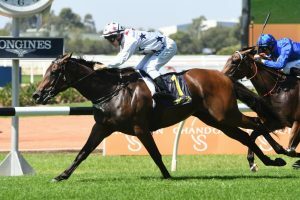 Sunlight was the $4.40 favourite last week, and has once again opened on the first line of betting ahead of the Coolmore Stud Stakes (1200m) at $4.20. Aiming to become the 11th filly to win the race since Nechita in 2012, Sunlight enjoyed a jumpout down the Flemington straight earlier this week, a run that taught McEvoy a thing or two ahead of the $1 million race. “We breezed her up on Wednesday, she’s as good as she could be” McEvoy told Racing.com. “She’s only had the one run down the straight, and that day we tried to hold her up, and that was a mistake. The decision to back up Sunlight following the Manikato wasn’t an easy one for McEvoy, but after she was bucking and kicking in the paddock midweek, the trainer knew she was eager to run. “She’s a tough filly, she gets really stimulated, the more you do with her, the better she gets. After the run on Friday night, I thought I’d just cruise with her and go into this race” McEvoy said. Sunlight has drawn barrier four ahead of the Coolmore, with Luke Currie earning his first ride on the filly. Her lack of experience at Flemington is only a minor concern, but if she can dictate the pace alongside Written By, who will also look to lead, she’ll be a serious chance down the straight. “It’ll be a strong race, Written By races that way, and my filly, I’m not going to change anything with her. Coolmore Odds can be seen below.